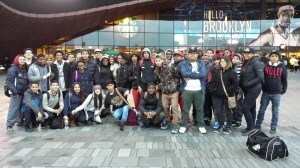 Forty students from WHSAD’s honor roll were invited to see the Brooklyn Nets take on the Charlotte Bobcats on March 19th. On Wednesday, March 19th, forty of WHSAD’s top students went to the Barclay’s Center to see the Brooklyn Nets take on the Charlotte Bobcats. This marks the second year in a row that WHSAD rewarded their top students by taking them to see the Brooklyn Nets solidify their rank on the Eastern Conference en route to the NBA Playoffs. Each marking period, WHSAD students who achieve honor roll status are invited to participate in free incentive field trips. Field trips range from basketball games, Broadway plays, day trips, and concerts. The next field trip will be a day trip and lunch at a local bowling alley. In order to be part of the honor roll, students must earn a minimum of an 85 average without failing a single class.